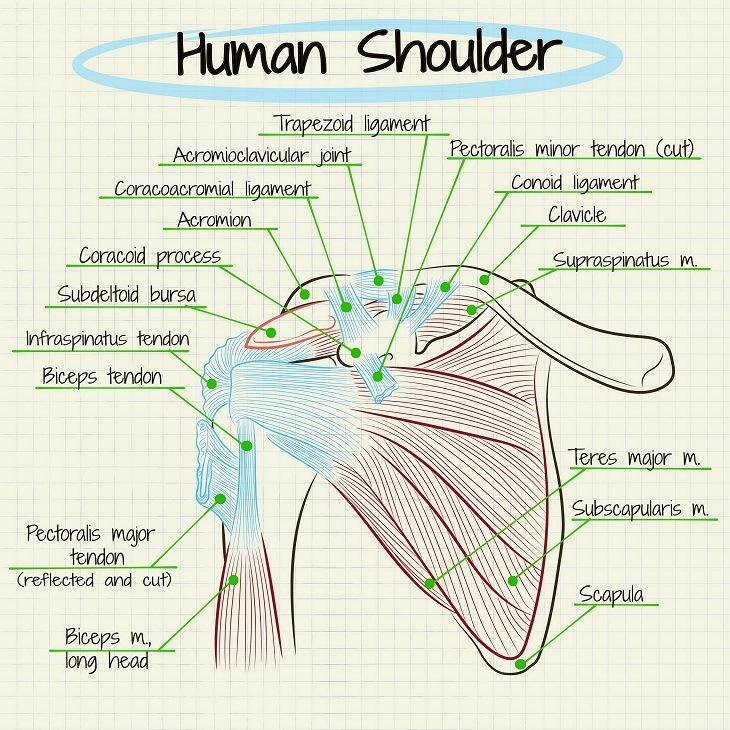 One of the most vulnerable joints in the human body is the shoulder joint. However, given that there is so much range of movement in the shoulder joint, it is surprising that more shoulder injuries don't occur. If you are experiencing shoulder pain during exercise, take a step back and determine the root cause. Below are simple hands-on tests that can determine why your shoulders are in pain. Ideally, we'd recommend getting a partner to assist you with each test. Here's How: While seated, have a partner raise the arm of your sore shoulder to the front and overhead as far as possible. One of their hands should be on your arm and the other hand supporting your shoulder blade (scapula). Cause: If the pain is felt in your shoulder, the test is considered positive. 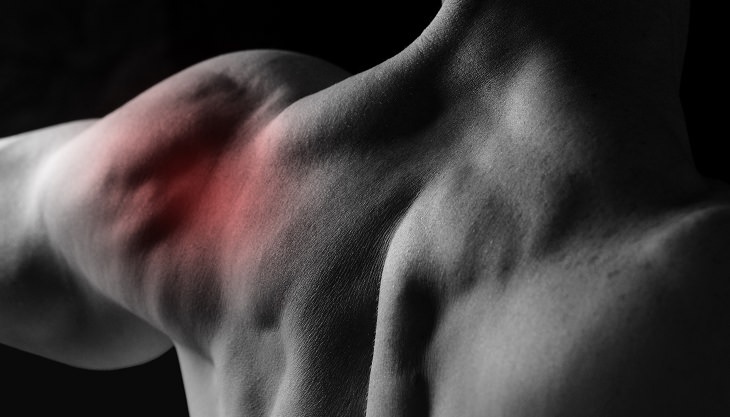 The pain is likely caused by impingement of the tendons or bursa in the area of your shoulder. Here's How: While seated, raise the arm of your painful shoulder forward to the front. While holding your arm out straight in front of you, turn your palm up. Ask your partner to then push your arm down, while you attempt to resist. Cause: If pain is felt in the front of the shoulder while resisting your partner arm, the probable cause is in the biceps tendon. The Labrum Tear can be tested in two parts: the apprehension and relocation tests. The Apprehension Test: Begin by lying on your back on a flat, elevated surface like a bench or a table. Move your arm out to the side perpendicular to your torso. Then flex your elbow to a ninety-degree angle. Ask your partner to slowly rotate your arm so that your hand moves toward your ear, pushing as far as possible. Maintain the ninety degree elbow flexion. Cause: If you appear to be hesitant about shoulder movement beyond the joint, this test is considered positive for a possible labrum tear. The Relocation Test: If your shoulder seems unstable and feels like it could potentially move out of place, especially when it's in extreme external rotation, gently press on the front of your shoulder to relocate the joint. Cause: If you feel less relocation and your shoulder feels more stable, then a torn labrum is the probable cause. Here's How: While seated, have your partner place one hand at the front of the shoulder joint and the other at the rear. Slowly but firmly, your partner should press on both sides of the shoulder to compress the AC joint - the part where the shoulder blade (scapula) connects to the collarbone (clavicle). Cause: If there is a joint separation, the pain will be felt in the joint between the hands. In addition, any pain felt while raising the arm upward or while sleeping are also indications of an AC joint separation. Here's How: While seated, have your partner raise the painful arm or shoulder to the side and parallel to the floor. Keeping your arm relaxed, your partner should then let your arm drop. Cause: If your arm drops involuntarily and you can't maintain that parallel position you may have a rotator cuff tear.